I woke up on Monday feeling groggy and ill (even after 8 hours of sleep), like I was hungover. It was probably dehydration from not drinking anything the entire night. The nasty All Greens juice was actually quite refreshing first thing in the morning, though it still took me an hour to finish. I could feel my shriveled insides absorbing the liquid; the constant peeing didn’t start until 1.5 hours after I started juicing. I made sure to have lotion with me, otherwise my hands would’ve gone raw from all the hand-washing. (TMI alert) At this point, there probably wasn’t very much solid food left in me, but I was unusually gassy. Suffice to say that I was making some strange noises in the bathroom at work. Not sure what that was about! I wasn’t necessarily hungry throughout the day, but I didn’t feel satisfied either. It was that weird limbo of not being hungry but still wanting to put food in my mouth, which is an affliction for most people who aren’t even doing a cleanse. The constant drinking meant that I didn’t even have time to chew gum. In general, I felt bored, and I had to remind myself of why I chose to do the cleanse. One of my main concerns prior to starting was a sort of chronic fatigue no doubt brought on by some internal chemical imbalance (namely, too much sugar) — I just wanted to sleep all the time, especially after eating, which was just annoying. I liked naps to begin with, but I was becoming dependent on them, and sometimes lying down to rest my eyes would turn into a three-hour snooze. After the crazy-tiring first day of cleansing, my energy levels were overall pretty consistent, which is what I was looking for. At 3 p.m., when I’d normally start my zombie transformation, I still felt the same as I did at 10 a.m. Huzzah! The worst part was how cold I was. Offices are cold to begin with, and drinking nothing but cold juice really doesn’t help. It’d probably be torturous to do a cleanse during the winter. Royal Flush: I was looking forward to a juice like what most people expect juice to taste like, but the prevailing flavor in this one is ginger. Blehh. Still, even a hint of pineapple beats the overpowering taste of celery. Initially I thought the “liver-kidney-lymph detox” ingredient was actually made of liver and kidney, which I just shrugged off — in that episode of Bizarre Food I watched, some Portland mom fed her kids banana smoothies with raw liver mixed in for a boost of iron. 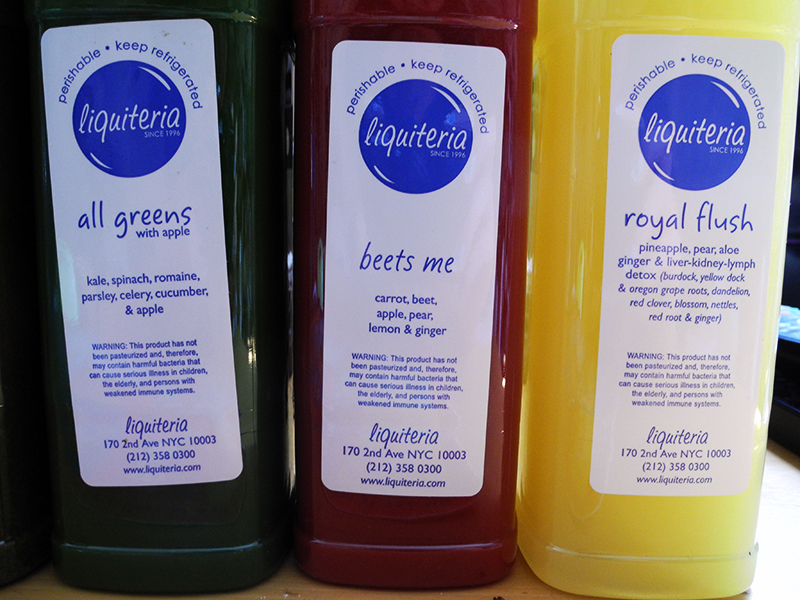 I happen to love liver, so… (to be clear, there’s no liver in Liquiteria juices). I didn’t experience the same nighttime crash and ended up sleeping at my normal time (2 a.m.). On the way to the office in the morning, I was drinking All Greens on the subway when I bumped into my coworker. He had done homemade juicing and recommended adding a squeeze of citrus – orange, lemon, grapefruit, etc. — to improve the flavor of any vegetable juice. Good tip. Mixed Veggies: This one tastes like straight-up carrot juice; it’s a little sweeter than All Greens With Carrot. As a raw carrot-lover, I’d say this one was pretty good. When I got home, it took all of my willpower to keep from eating something, anything. It didn’t help that my roommate was in the living room eating sushi with little C and talking about how delicious their salmon was…ugh. Instead, I took a nap. 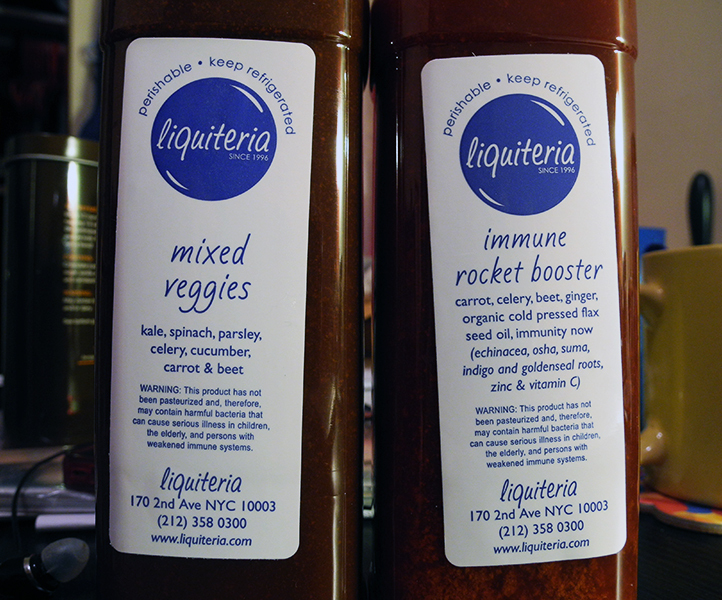 Immune Rocket Booster: I drank this right after brushing my teeth, so some of the flavor got lost on me, though I could still taste the ginger and carrot. I looked forward to never drinking liquified ginger again — the stuff is just not for me. Halfway through the bottle, I just gave up. It had a thicker consistency — probably due to the flax seed oil — that I just couldn’t stomach. So I wandered to the kitchen and ate a bagel. HAHAHA FAIL… It wasn’t a delicious bagel by any means, but it was still so satisfying to chew. I decided to spread my remaining 3.5 juices over the next few days. I choked down the rest of the Immune Rocket Booster before heading off to my last day at MyBankTracker. I knew I had to pace my eating after coming down from a cleanse, but there just happened to be an unusual amount of delicious food in the office. For lunch, we ordered delicious pizza from Il Porto, and I managed to restrict myself to just one slice. Then in the afternoon, we were celebrating someone’s birthday with two amazing cakes from Almondine Bakery. I could not help gorging myself on a huge piece of chocolate mousse cake because it was SOOO GOOD. I was stuffed but otherwise fine until dinner — my coworkers took me out for Mexican food as a farewell, and boy did we order a lot more food than we could handle. The sudden intake of rich carbs, oily meat and half a cocktail caused pandemonium in my digestive system. Let’s just say I made friends with the delightfully posh interior of Gran Electrica‘s bathroom at the end of the meal. After that, I ended up freezing the remaining bottles of juice. Maybe they’ll taste better after some time spent away. You’ll definitely feel balanced — gone are the typical highs and crashes from eating sugar-laden simple carbs. Drinking juice out of a bottle all day keeps your lipstick from smearing (small but significant victory!). Like any meal plan, this is good for people who hate cooking or are indecisive about what to eat. You get lots of exercise walking to the bathroom 25 times a day. Fresh juice means no stanky breath. If you think a juice cleanse will be a quick fix to get thin, you’ll probably be disappointed (unless your normal eating habits are THAT bad). Sure, I was slightly slimmer from the lack of salt and solid food, but I didn’t feel significantly svelter afterward. So it could be a con depending on your motivations. Frankly, I’ve lost more weight eating $1 cans of beans for every meal. You might think you love carrot juice, but you’ll probably hate it afterward :( I can still taste the mix of carrots and ginger, and it gives me nightmares. Think about how much celery, lettuce, spinach and carrots you could buy for regular eating with $150! Many a delicious salad could be made. Ultimately, I would not choose to do another pre-bottled juice cleanse (unless someone paid me to do it, maaaybe). The tangible benefits don’t seem to be that much greater than just eating a healthier diet. One bottle would probably be good for a snack or energy boost, and that’s only if you truly enjoy the taste of raw carrots, celery or ginger. For the price, I’d expect the cleanse to be either delicious or miraculous, and it wasn’t either. Skeptics, you win this round! Thanks for the funny read. I’m on the same page as you about the cleansing and i’m glad i’m not the only one that really missed chewing! You are currently reading Last Days Of The Juice Cleanse And Why I Wouldn’t Do It Again at auradis.